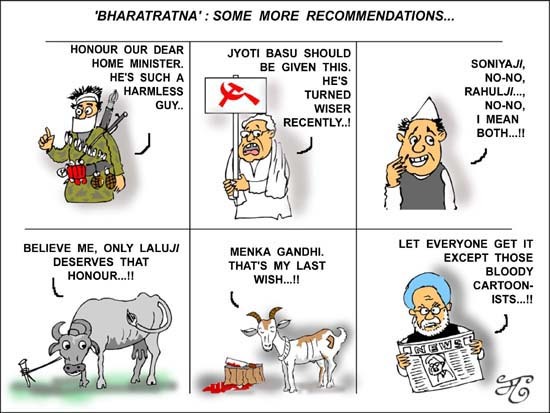 The unseemly clamor by politicians for securing the Bharat Ratna for their heroes - alive or dead - has revealed how segmented the Indian polity has become. Virtually the entire political class is seeing the award through the tunnel vision of caste or community or party, demonstrating that partisan considerations alone matter to it even when recommending a supposed stalwart of national stature. There is little doubt that a sad spectacle such as the present one over this most prestigious of national awards would have been unthinkable in the early decades of the post-Independence period. Now, however, narrow sectarianism has come to dominate the scene primarily because of divisive politics based on casteist and communal campaigns for votes. So in today's cynical world, it is only natural that L.K. Advani will plead the case of his senior in the Bharatiya Janata Party (BJP), Atal Bihari Vajpayee, to the exclusion of everyone else. Or Mayawati will seek the posthumous recognition of her mentor in the Bahujan Samaj Party (BSP), Kanshi Ram. Or Ram Vilas Paswan will try to refurbish his Dalit credentials by recommending the name of the 19th century Dalit icon, Jotiba Phule. Or that Meira Kumar, union minister for social justice, will name her father, Jagjivan Ram, who was India's foremost Harijan leader when the Dalits were known by that name. Or the Akali Dal will demand the award for its leader, Punjab Chief Minister Parkash Singh Badal. Or the DMK will argue in favour of its leader, Tamil Nadu Chief Minister M. Karunanidhi. Or the Rashtriya Janata Dal (RJD), the party of the Other Backward Classes (OBC), will want the award for its OBC leader of the 1970s, former Bihar chief minister Karpoori Thakur. Or the Rashtriya Lok Dal will recommend the name of Lok Dal leader and former prime minister Charan Singh. Or the Bhojpuri Samaj will put forward the name of another former prime minister Chandra Shekhar. Or, perhaps the most bizarre of all, the deputy speaker of the Delhi assembly, Shoaib Iqbal, will propose the name of Bahadur Shah Zafar, the last Mughal emperor, who was toppled by the British colonial rulers during the 1857 uprising. Although the Marxists have no time for the awards of a "bourgeois" state, the name of Jyoti Basu, the nonagenarian patriarch of the Communist Party of India (Marxist), did come up for a while before Basu himself expressed his disinterest. Much of this would have been amusing if these preferences didn't show how impervious the politicians have become to the concept of India as a total entity. To them, the nation is evidently divided into the groups to which each of them belongs. Surprisingly, the only party that did not mention one of its own is the Shiv Sena, probably because it has only one leader, its supremo Bal Thackeray. Instead, the party named Ratan Tata, whose Rs.100,000 ($ 2,500) car, the Nano, has taken India and the world by storm. But Tata may have been mentioned because he belongs to Mumbai, the city where the Sena has its base. The narrowness of outlook reflected in these choices can be discerned, of course, almost daily in the politics of these parties. None of them seems to act with the interests of the entire country in mind. Instead, they are for ever pushing their own partisan agendas, whether it is the anti-Americanism of the Left, or the caste- or region-based preoccupations of the parties confined mainly to single provinces, like the RJD or the DMK or the Akali Dal. What is worrisome, however, is that even as these parties tend to look at India like the blind men see an elephant - mistaking a part for the whole - their restricted vision does not prevent them from occasionally adopting an anti-national stance involving other countries. For instance, Karunanidhi recently lamented the death of a leader of the Liberation Tigers of Tamil Eelam (LTTE) much to the discomfiture of the union government and the Congress party, whose leader, Rajiv Gandhi, was killed by an LTTE suicide bomber. And the Akali Dal pretended to look away when the Shiromani Gurdwara Prabandhak Committee (SGPC), the highest religious body of the Sikhs, decided to "honour" Jarnail Singh Bhindranwale, the leader of the Sikh separatists in the 1980s, along with the assassins of Indira Gandhi. In both these cases, community solidarity has been given precedence over the national cause. The bonds between the Tamils of India and Sri Lanka are highlighted by Karunanidhi's gesture, and the commonality of Sikhs, including the secessionist Khalistanis who had Pakistan's support, in the SGPC's decision. It isn't only the communists, therefore, who are suspected of extra-territorial loyalties. It is not surprising in these depressing circumstances that no Bharat Ratna has been awarded since 2001 by the government of India. The recipients in that year were the well-known shehnai player, Bismillah Khan, and the singer, Lata Mangeshkar. Before that, in 1999, the award was given to Nobel prize winning economist Amartya Sen, sitar player Ravi Shankar, and posthumously to Jayaprakash Narayan, the Sarvodaya leader, and to Gopinath Bordoloi, a freedom fighter belonging to Assam, also posthumously. What the list underlines is that there hasn't been any worthwhile claimant from the political field in recent years. The dearth is explained by the antics of politicians over the award this year.